In an attempt to decrease my 2 mile run time, I purchased a Garmin Forerunner 10 GPS watch. So far it has been the best and worst (in a good way) investment that I have ever made. But first lets go over the main features. 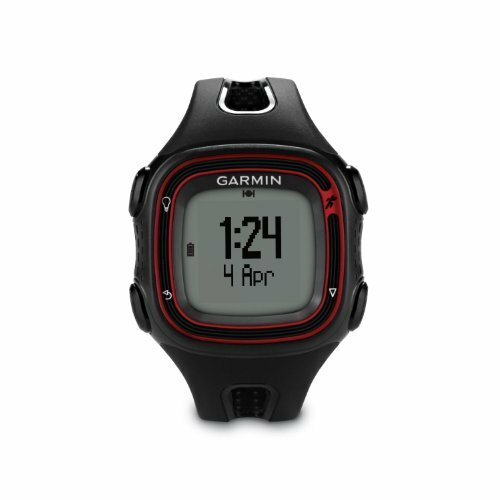 The Forerunner 10 is the base model Garmin GPS watch. It's basically only good for moving on your feet. There are no bike or swim settings. I have so far used it for running and ruck marching. I find it especially useful for rucking as its easier to go faster with a ruck than when your already going all out during a run. Being 100% geared towards running, it does do its job exceptionally well. The most basic feature is simply tracking your runs. It tracks your run's distance, time, mile or KM pace, calories used, and lap times (miles/KM). It also keeps your records. It stores your fastest mile, fastest 5k, fasted 10k, and longest run. the best part of its recording features is that you can upload your runs to Strava.com. Strava is an app and website that records your runs, bike rides, and other metrics while putting you in a competitive social environment against your friends. Usually used with your phone, you can upload the .gtx file from your watch to your Strava account with the watch's USB charger. The watch doesn't have the best battery power so its not for all day use. I plug it back on the charger and upload my run right when I get back from my workout. Be sure to charge it completely beforehand if you are going to use it before a race. The best performance features however are two fold. Tracking your pace during a run, and run-walk settings. I said before that this is one of the best and worst investments that I made, and here is why. Before starting your run you can set the pace you want to run to. The watch will beep at you when you are moving above the pace, on pace, or below pace. Of course when you start fresh you are above pace, and when you dip down to on pace you don't want to risk going below pace so you run faster. This is where the pain comes in, but I can only see it help my run times and my leg's muscle memory to run faster (my personal limiting factor). It also helps a lot in letting you know what your target pace feels like as well. The other performance feature is a run-walk setting. You are able to set the times that you want to on and off run and walk to. This is particularly helpful for Fartlek runs. It again beeps at you when to walk and run. It even has small count down beeps before running again. Another convenient feature is a an auto pause setting. The watch will detect when you dip down to a walking speed and pause your run. It will also detect when you speed back up again to restart the run. The setting is great for casual runs in which you come across busy intersections, or stop to talk to a friend. You can also run more than one setting at a time. Particularly useful is the pace setting paired with auto pause. So far this watch has been great, and I highly recommend it. Within two weeks I knocked over 30sec off my 1 mile time. Its almost exclusively from just knowing what running my target pace feels like! The beeps are encouraging. I can only see my times getting better and better. Of course one of the primary reasons I picked up one is these is, well, the price. Its hard to beat. Compared to its competitors it has more bang for the buck for most people who won't use the complicated features of the higher priced watches. You can pick one up for your self right below. I hope this helped you, and let me know how you use it if you have one, or any other GPS watch.